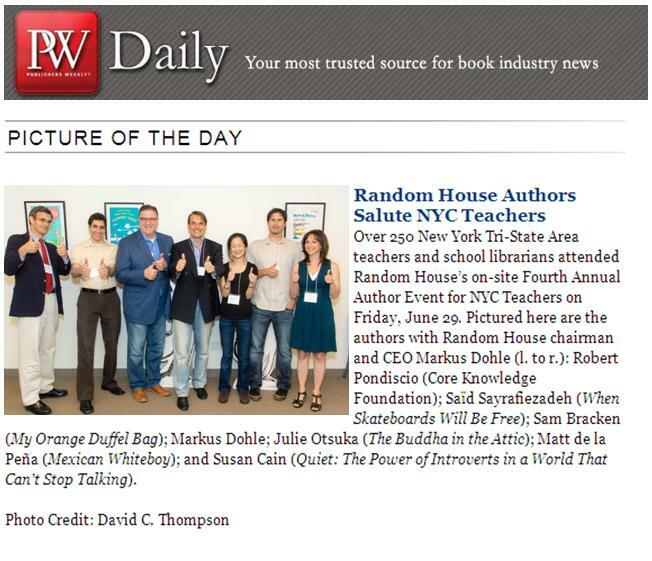 On Friday, June 29th, Random House hosted its Fourth Annual Author Event for NYC Educators in its midtown NYC headquarters. The event was attended by 200+ K-12 educators, school librarians, and college professors/administrators. A PDF of the event program may be viewed here. We are happy to announce that photos and video from the event is now available for all to view. Event photos may be found on the Random House High School Facebook page and video may be found on the Random House Library YouTube channel. Random House, Inc., in cooperation with the National Council of Teachers of English, is proud to announce the launch of The Random House Foundation, Inc. Teacher Awards for Literacy. These newly created awards honor educators’ innovative ideas in the field of literacy education. Three cash prizes will be awarded to help further or implement innovative practices in reading in K-12 classrooms.